“Plants are my passion,” says Assistant Professor Jessica Budke, whose research focus is on the development and evolution of mosses. 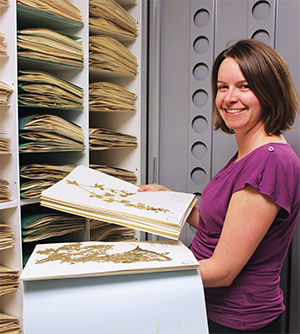 As the new director of the UT Herbarium, she is proud to carry on the strong tradition of bryological research at UT, which began in 1934 with A. J. (Jack) Sharp. The herbarium, UT’s plant library, is one of the largest in the Southeast with over 600,000 specimens from across the state of Tennessee and beyond. This biodiversity collection serves as a resource for researchers studying global climate change, biological invasions, and species relationships. “Our research abilities and the increasing usefulness of biodiversity collections for the study of our living planet will continue to expand as we look to the future,” says Budke. The herbarium is located in Temple Hall. Budke and her team are planning renovations to enhance the space and increase visiting researcher capacity. They are also expanding the herbarium team to include additional undergraduate students to participate in ongoing mounting and databasing projects. Stay in touch with the UT Herbarium! Learn more about the herbarium online at http://tenn.bio.utk.edu/.